A Vote for the Enneagram! To start off, this is not a blog entry to bash on people who do not believe in the use of enneagram. My goal is not to change your mind (whether or not you believe in the enneagram) or anything; this is just to express my feelings and opinions about it. As a college student, I have, and still, many times wondered and stressed about what I would major in (and even worse, what I want to do for the rest of my life). There are so many choices out there! Of course, there are the subjects I know I definitely do not want to major in. Like computer science (Where’s that “print” button?! I just saw it a moment ago…) and art (What do you mean that’s a cool abstract painting? That’s my self portrait!). Then there are the subjects I think might want to major in, but am not sure. Like sociology, music, integrative biology… and of course, psychology. I mean, who hasn’t considered psychology as a major? Psychology is the most popular major in my university. Whenever I talk to people about psychology, I always hear “No way! We’re twinsies! I’m doing it too!” and “Dude … do it! It’s interesting!” But it’s not always positive comments I hear. I have heard comments that psychology, and more specifically, the enneagram, is not all it is hyped up to be. That all it does is try to “label” you and put you in a box. That it is just common sense and shouldn’t even be called science. However, I disagree. The enneagram isn’t trying to put you in a box. 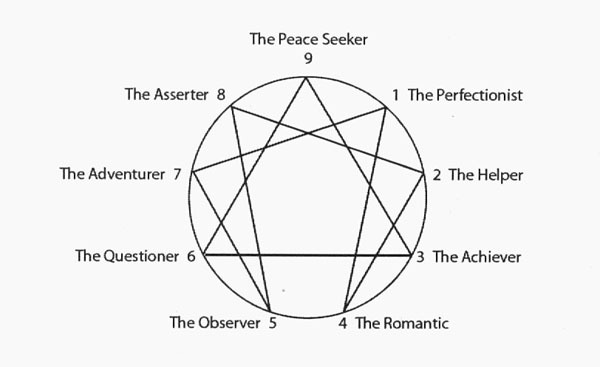 The purpose of the enneagram is to help you find more about yourself. I mean, if you deciding which of the 9 types of people you are means putting yourself in a box, then other numerous things that many people think about in everyday life are also restricting. For example, labeling yourself as a “morning person” or a “night person” would be putting yourself in a box. It’s just human nature to distinguish certain characteristics and how to best use those to your advantage. Just as a “night person” would rather stay up into the wee hours into the night to be creative or to do work, an “Adventurer” would rather be up and doing something interesting [active] instead of, say, watching paint dry. It also isn’t telling you what to do nor is it restricting at all. The enneagram doesn’t say “According to these bullet points, you are a Helper. So now go help people 24/7.” It is just showing that there are many other people like you out there, and based on some of your characteristics, you seem to be like a Helper (or any of the other 8 personalities) and you might benefit from the suggestions specifically made for people like you. So this is just my opinion of the enneagram. I love to hear all these contrasting opinions on topics and subjects. It gives me a more well-rounded and less biased view on it and it makes me think about what I really think of certain subjects. And apparently, despite all the statements that disagree with certain points of psychology, including the enneagram, psychology is still definitely on my extensive list of “maybe” majors.